If you look closely, you’ll notice some key differences between Japan and the United States. Different sizes, for example. Different average heights of their human inhabitants. 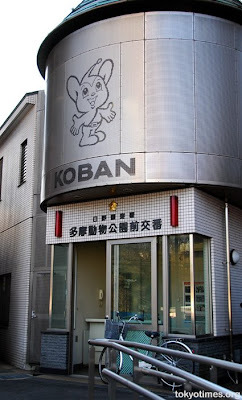 Japan has Godzilla, while the U.S. has King Kong. The most important difference between the two nations, however, would probably have to be the presence of Pipo. I’m guessing you do not know of Pipo. If that’s the case, you probably don’t live in Japan. He also seems to delight in making vague demands. 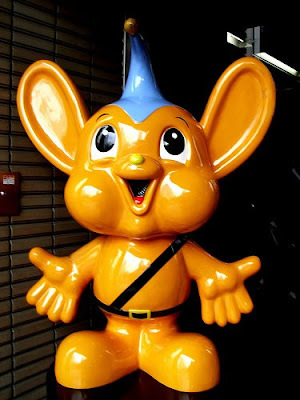 And even in disturbing plastic statue form. 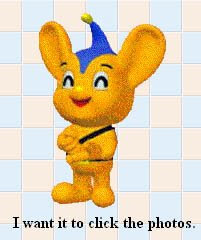 The one thing Pipo can and probably does have that McGruff doesn’t is a rousing theme song, which is available in an angelic MIDI format on Pipo’s personal homepage as well as in a full, vocal version that kind of sounds like a national anthem… until the baby voiced-woman chimes in, possibly speaking for Pipo. Really, you must listen to it. Your life will be more complete as a result. So, in short, if you’re reading this now and don’t know what country you’re in, go to the police station and ask about Pipo. Or at least ask the lady at the desk if she can sing Pipo’s theme song. 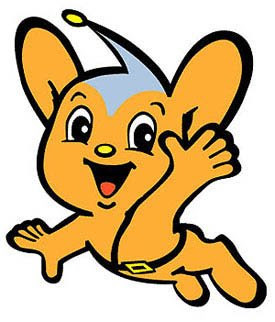 If you don’t see Pipo or hear high-spirited songs telling of his exploits, you’re probably not in Japan. Now you know. 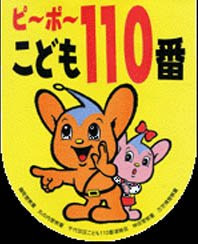 Actually I think what Pipo is saying in that image is こども１１０番, ie "kids, the emergency number for police is 110".